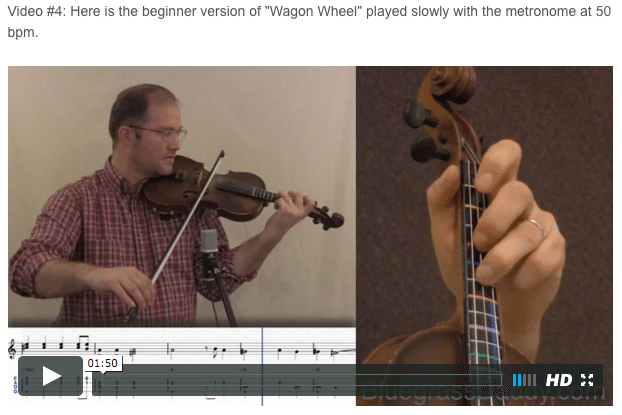 This is an online fiddle lesson for the Darius Rucker version of "Wagon Wheel." Video #1: Here is a video of me playing the Darius Rucker version of "Wagon Wheel." Video #2: Here is a video of me playing the beginner break for "Wagon Wheel." "Wagon Wheel" is a song originally sketched by Bob Dylan. It was later modified by Ketch Secor of Old Crow Medicine Show. Old Crow Medicine Show's version was certified platinum by the Recording Industry Association of America in April 2013. The song has been covered many times, most famously by Darius Rucker in 2013, who made it into a number one Hot Country Songs, and English singer Nathan Carter in 2012. 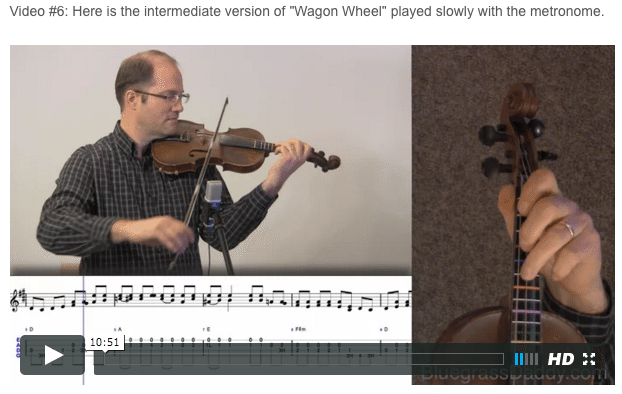 "Wagon Wheel" is composed of two different parts. The chorus and melody for the song come from a demo recorded by Bob Dylan during the Pat Garrett and Billy the Kid sessions. Although never officially released, the Dylan song was released on a bootleg and is usually named after the chorus and its refrain, "Rock Me Mama." Although Dylan left the song an unfinished sketch, Ketch Secor of Old Crow Medicine Show wrote verses for the song around Dylan's original chorus. Secor's additional lyrics transformed "Rock Me Mama" into "Wagon Wheel." Chris "Critter" Fuqua, school friend and future bandmate, first brought home a Bob Dylan bootleg from a family trip to London containing a rough outtake called "Rock Me, Mama" (from the "Pat Garrett and Billy The Kid" soundtrack sessions) and passed it to Secor. Not "so much a song as a sketch, crudely recorded featuring most prominently a stomping boot, the candy-coated chorus and a mumbled verse that was hard to make out," the tune kept going through Secor's mind. A few months later, while attending Phillips Exeter Academy in New Hampshire, and "feeling homesick for the South," he added verses about "hitchhiking his way home full of romantic notions put in his head by the Beat poets and, most of all, Dylan." Secor's verses tell "the story of a man who travels from New England, through Philadelphia, PA and Roanoke, VA, down the eastern coast of the United States, ending up in Raleigh, North Carolina where he hopes to see his love." They contain a geographic impossibility: heading "west from the Cumberland Gap" to Johnson City, Tennessee "you'd have to go east." Secor explains: "I got some geography wrong, but I still sing it that way. I just wanted the word 'west' in there. 'West' has got more power than 'east.'" The Dylan outtake, generally titled "Rock Me Mama", came out of recording sessions for the Pat Garrett and Billy the Kid movie soundtrack (1973) in Burbank, California. This topic contains 14 replies, has 9 voices, and was last updated by John Cockman 6 days ago. 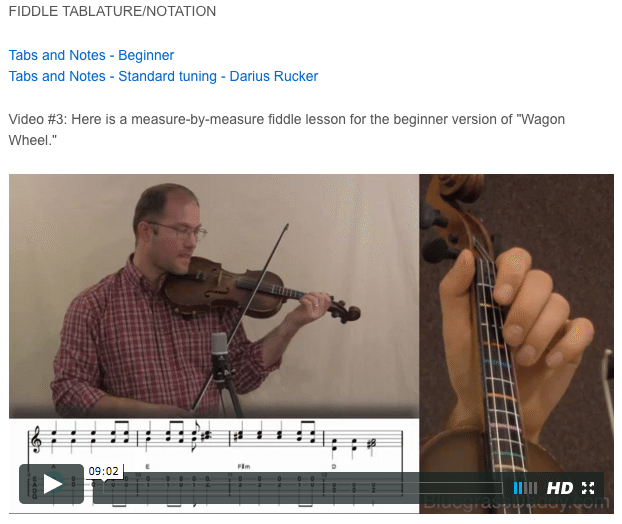 I have made a complete lesson for the Darius Rucker version of Wagon Wheel. It also contains the beginner version. The Ketch Secor version is a separate post. One of my favorites! Outstanding John. Nice…another one I oughta learn. The jams I go to play this one once in a while. Great rendition of this song, John! Thank you! You have out done yourself! The singing, the lead fiddle, fiddle back up and the other guy singing harmony. That Was Great, John! 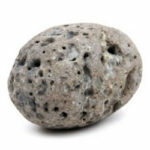 That other guy was a good singer, wasn’t he, Rock? 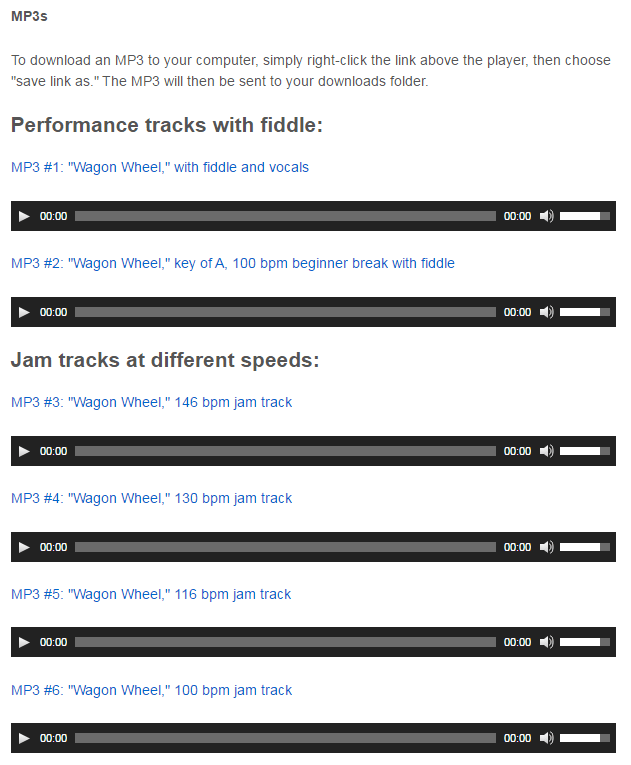 I didn’t realize there was another Wagon Wheel lesson already on here too…duh, where have I been? I do need to learn it because it gets played every so often around here. Now my usual problem…deciding where to start…lol…I think the sawmill tuning one would probably be my best bet! I love playing the fiddle in that tuning. Thanks you all. 🙂 Kaeleigh, the Darius Rucker version is easier for me than the original, mostly because I’m not that good at cross A tuning. Give it a try and see! That was the best presentation I have seen, WOW! As usual , very awesome, almost makes me cry, I m so turned on to this song , I feel like learning it now for sure. 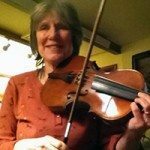 Seems like one I could sing too, be nice to bring a singing song to the Sunday Jam and do the fiddling. Just great John, I heard it on the radio just the other day, made me think of you, it s going around this song, I m sure folks around these parts would enjoy it. Thanks again for all the inspiration and hard work you are doing for us. I remember falling in love with this song the first time I heard it. So many things were right about it… It was played in such a retro style, had sentimental lyrics about North Carolina, and had that super-catchy chorus written by Bob Dylan. I knew the minute I heard it that it would be a hit. I love the way the Darius Rucker retains the focus on the fiddle. 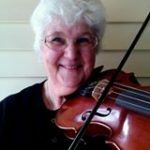 And what a singer her is — this is one of my all-time favorite fiddle-featuring song. Great job on this! I play this at some jams here and your lesson will help me to change it up some! Yes, I like the focus on the fiddle. When this song is done without a fiddle and only guitars and singing,……boring…I think (from one fiddler to other fiddlers). Thanks Kris. You’re right — the fiddle absolutely makes this song. When the fiddle starts in, you can see the entire crowd light up. Smiles on every face, applause, etc. You don’t get that with the other instruments! your version of Wagon wheel doesn’t seem right. Are you using a different tuning rather than normal. I’ve found other copies that have the melody on top of the double stopping . 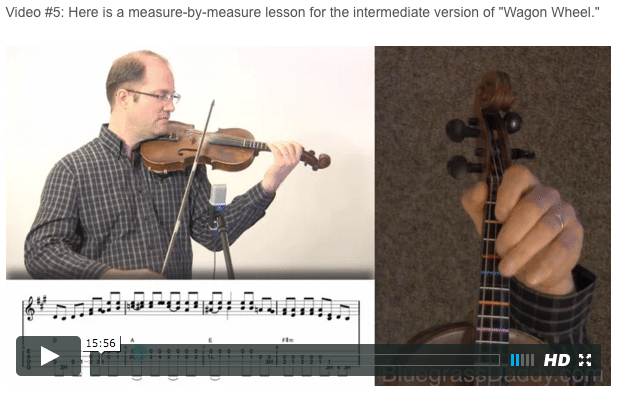 Whilst listening to the song the violin part as done by funky whistle.com seems more accurate. Ketch Secor’s fiddle in the OCMS version is tuned to AEAE. In the above link, I also include some sheet music in standard tuning that is similar similar to the funky whistle approximation. However, my lesson is for the authentic break.